I have a long and ever-growing list of places I want to visit, one that’s been hovering around the top for a while is The Parkers Arms in the Ribble Valley near Clitheroe. I know the area well having visited Nigel Haworth’s country pub ‘The Three Fishes’ in the nearby village of Mitton many times. The Parkers Arms reputation has been growing lately, I’ve read many positive reviews and seen them featured in The Sunday Times 2012 Food List, The Independents’s Top 50 Country Pubs and The 2013 Good Food Guide. But the main reason I was keen to visit is from following head chef Stosie Madi on Twitter for the last year or so. Through her tweets it’s obvious how passionate she is about food and I particularly love how proud she is to use the best seasonal and local produce in her cooking. Being a huge seafood fan, as soon as I heard about their Good Friday Fish Fest, it seemed the perfect opportunity to finally visit. I decided to take my seafood loving Dad along for his upcoming birthday too. It’s a cliche to describe rural areas as beautiful, picturesque etc.. but the Ribble Valley really is stunning. Luckily for me, my Dad had insisted on driving so not only did I get to drink wine but I thoroughly enjoyed the drive through the countryside as a passenger. 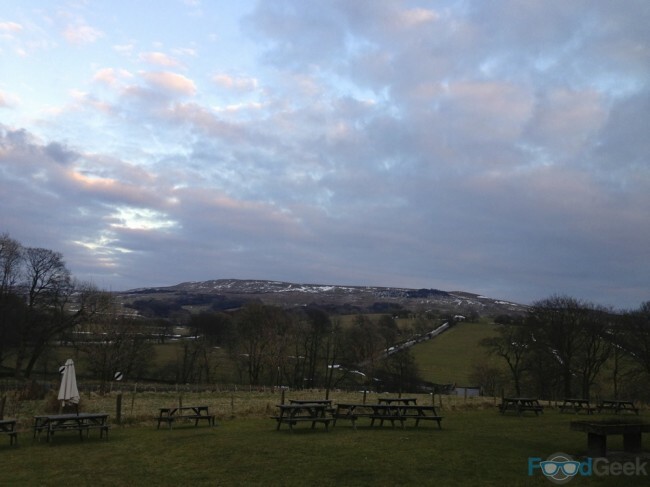 After arriving at The Parkers Arms in the tiny hamlet of Newton-In-Bowland I spent a couple of minutes taking in the breathtaking views before walking through the door and admiring the charming country pub complete with roaring log fire. We were greeted by AJ who was every bit as welcoming as I expected after a couple of earlier phone calls. The Good Friday Fish Fest menu contained a number of starters, main courses and desserts from which you could select one of each to form a 3-course meal or 2 of each as part of a 6-course tasting menu. However, through Twitter Stosi knew I was coming and kindly offered to provide all 9 courses for us to try, including some which were never intended to be eaten as part of the tasting menu. Needless to say, we gratefully accepted. Both were delicious but the third beat them comfortably; a slice of crispy chicken skin topped with garlic custard and bacon was one of the tastiest & most exciting mouthfuls I’ve had for a while. Whatever it is or should be called, it was absolutely amazing. I’ve had plenty of “Scotch Eggs” in my time with some interesting fillings such as the stunning black pudding scotch egg at Aumbry but I’ve never heard of one filled with risotto. A perfectly cooked hens egg surrounded with a layer of delicious smoked trout risotto. A genius idea that tasted fantastic. 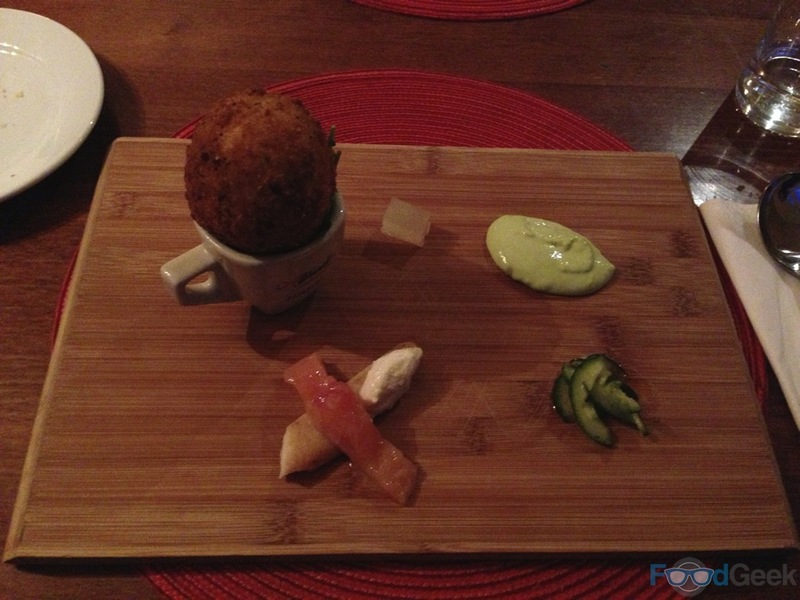 Each of the accompanying items; garlic custard, pickled cucumber, smoked & soused trout and lemon jelly added a unique and interesting flavour to a wonderful opening dish. When the second course arrived, despite it looking beautiful and smelling even better I must admit to being slightly disappointed that the mussels had already been removed from their shells. I know it’s common practice in quality restaurants and I understand why they do it but I still get immense enjoyment from shelling them myself. The slight disappointment only lasted around 10 seconds though as the dish was excellent. 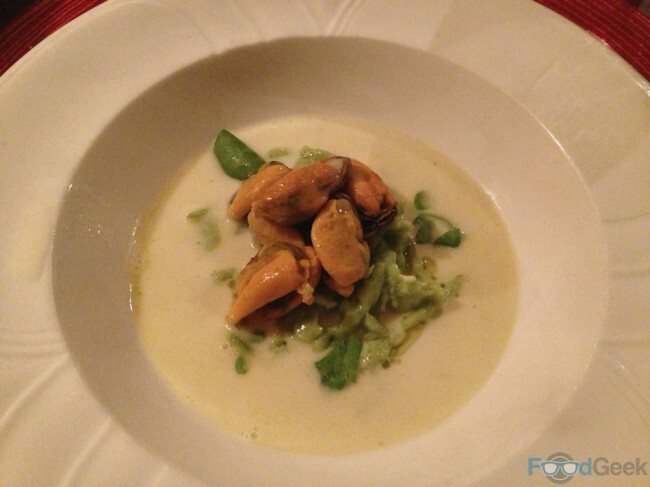 From the light but flavourful broth to the perfectly cooked mussels and particularly the parsley spatzles. I’d never encountered spatzles before and didn’t really know what to expect, I still don’t know much about them except they’re sort of soft, small dumplings and I loved them. Stosi confused us by sending out a main course next rather than the final starter. I felt cheeky asking about the missing dish as she was already providing much more than we expected to receive but I didn’t want to miss out on the sardine starter. AJ returned from the kitchen and assured us that Stosi had not messed up but had purposefully sent out this main course first so it wasn’t overpowered by the strong flavoured sardine. 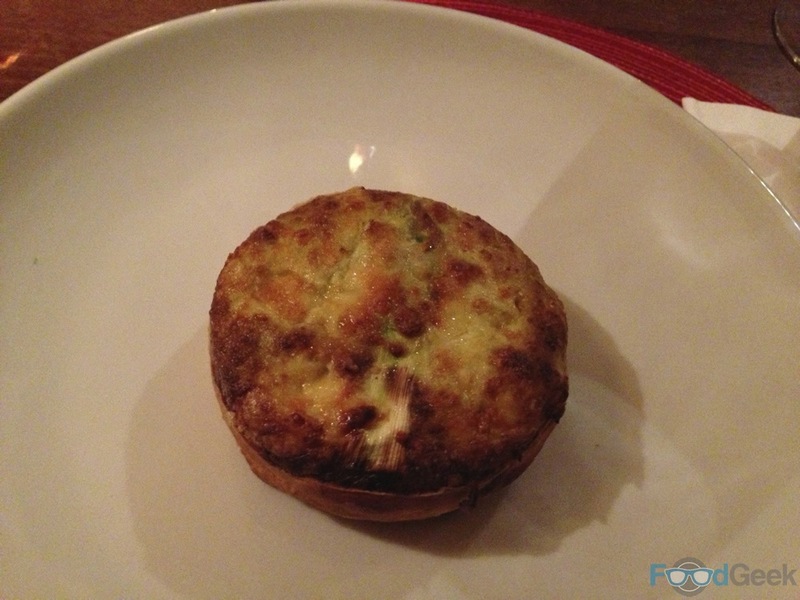 The seafood & asparagus tart main course was simply stunning. The pastry even better than those canapés earlier and the most amazing filling of cockles, shrimps and scallops. I doubt there is a pub in the country serving a tart anywhere near this quality. I also loved that as with almost everything on the menu we knew where all of the ingredients were sourced: Morecambe Bay cockles, Southport brown shrimps, Isle of Man queen scallops and even new season Wye Valley asparagus. 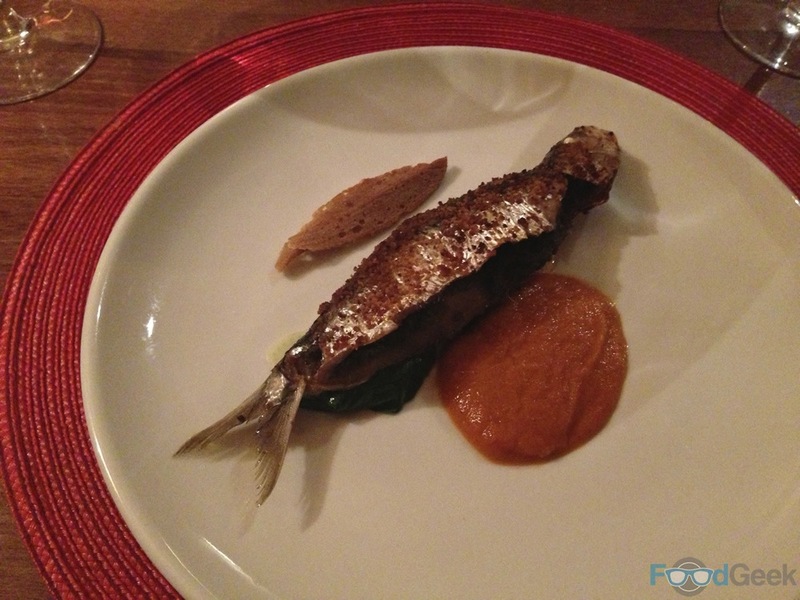 The switched around starter of ‘Cornish sardines, tomato ragout, Parkers pumpernickel’ was good too . The fish, well cooked with an excellent crispy skin was sitting on a bed of basil & fennel which with the intense tomato ragout transported me to the Mediterranean. I was quickly brought back to reality by the log fire and sight of snow on the nearby hills. The crispy homemade pumpernickel added a nice crunch. After eating both dishes, I agreed that switching them around made perfect sense and promised not to question the chef again. 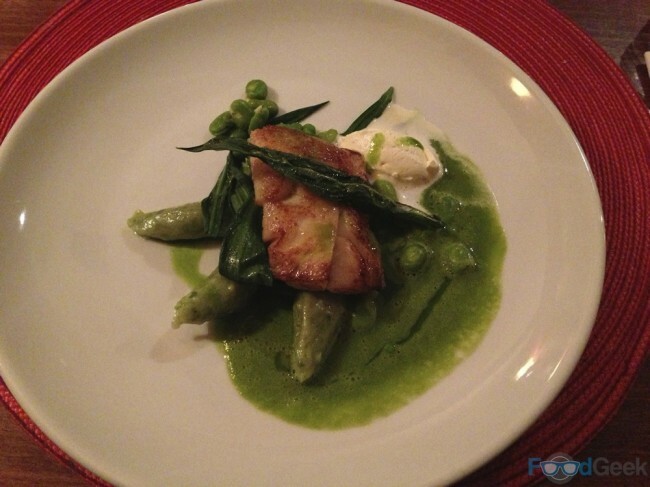 The following two main courses both contained substantial pieces of fish. The first, haddock (Fleetwood landed day boat) had a lovely brown crust but was beautifully soft, moist & flaky inside. Served with soft, silky wild garlic gnocchi which I loved and a watercress & wild garlic velouté. Personally I found the quenelle of garlic cream a touch overpowering, though it didn’t stop me cleaning the plate as the dish overall was another triumph. Whole roast Lemon sole (Fleetwood day boat landed) was expertlycooked on the bone. 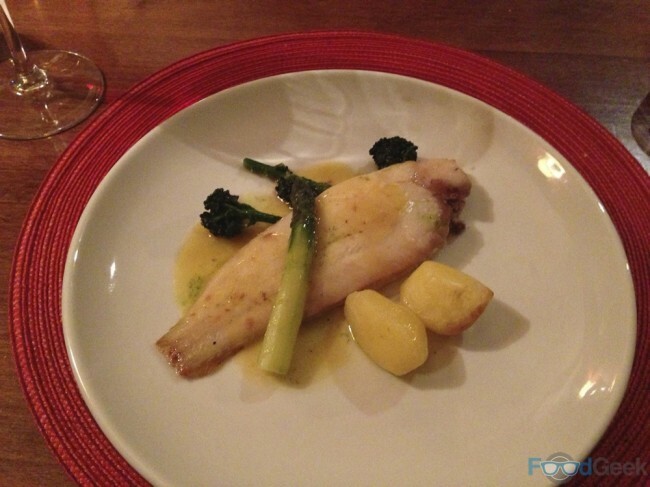 Served simply with brown lemon butter, new potatoes and sprouting broccoli. 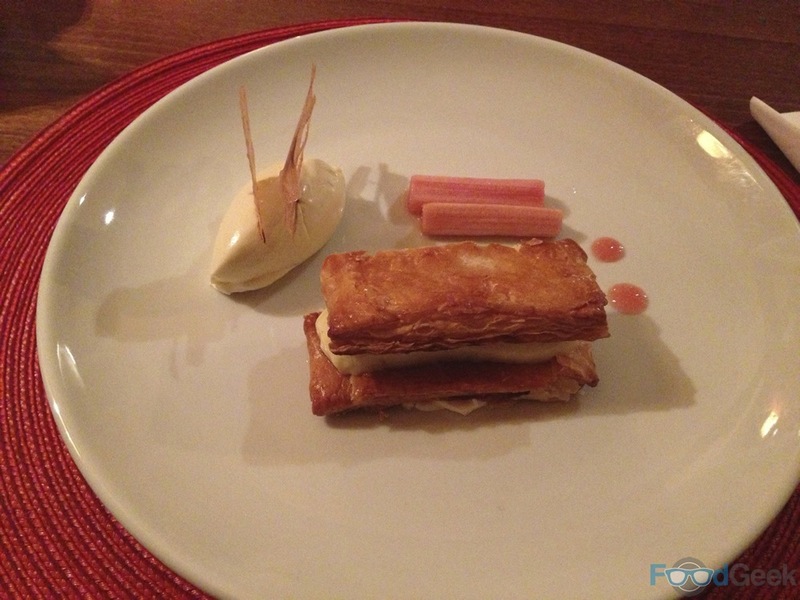 The first of 3 desserts ‘Champagne rhubarb, ginger & duck egg custard slice’ was my favourite dish of the night. I love rhubarb, ginger and custard so had high hopes which it somehow managed to exceed. It looked beautiful and tasted just as elegant. As with the other pastry dishes this was really high quality, with an amazing crunch that then flaked and metled in your mouth. 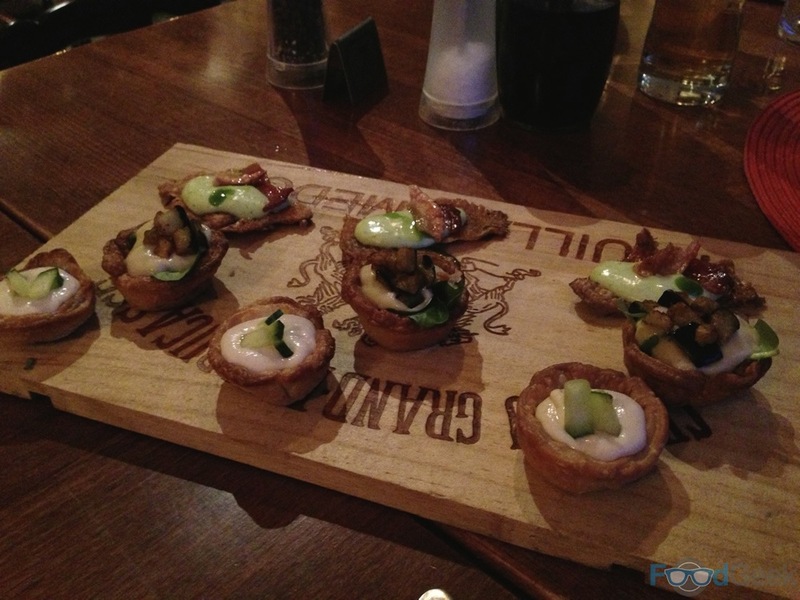 The flavours were balanced perfectly and worked together so well. 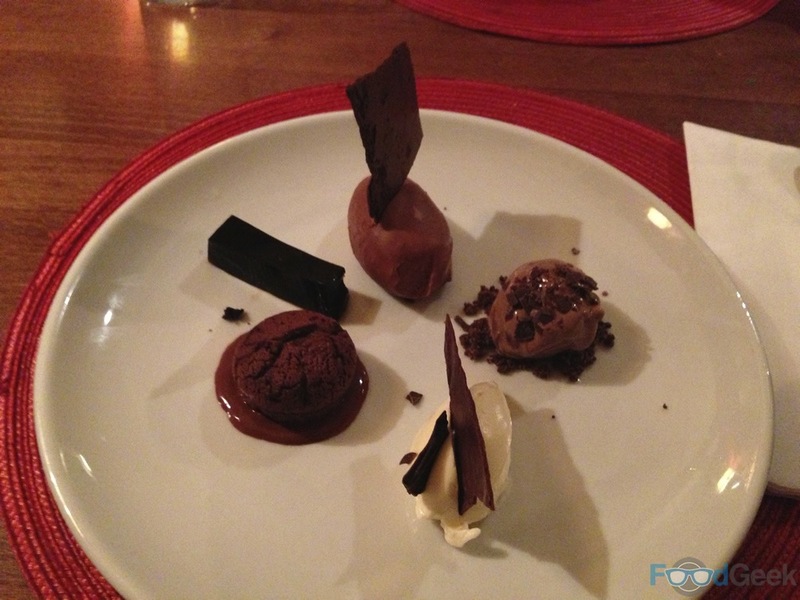 I’d happily drive all the way back to The Parkers Arms to eat this dessert again. The second dessert of ‘Malt bread ice cream with orange preserve’ was one that I probably would never have ordered so I’m extremely grateful that Stosi sent it out anyway as it was really good. 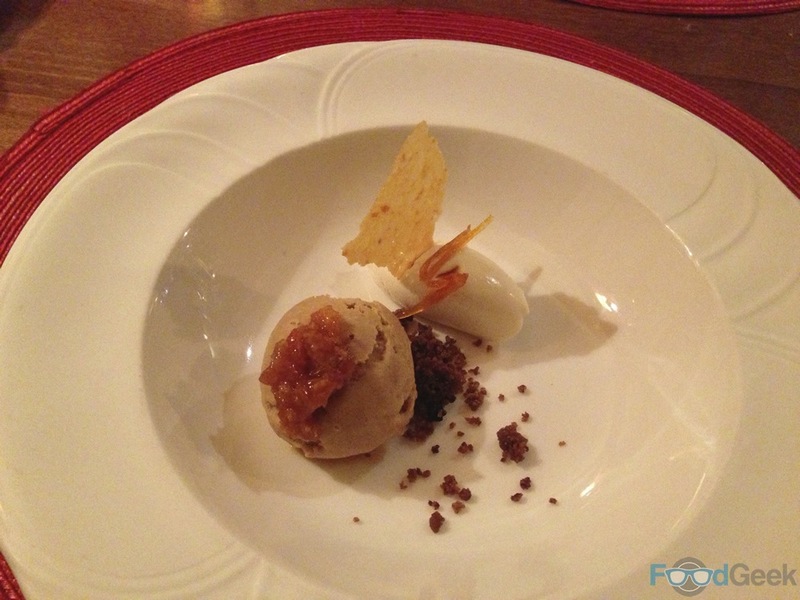 The ice cream itself was delicious with an almost savoury malt flavour again combined brilliantly with the other elements of the dish such as the tuile, orange preserve and particularly the crumbs which had a rich, treacle like flavour. By this point my Dad was getting full and Mrs FG had almost given up but I was still hungry for more (not literally hungry but you know what I mean), especially when I saw the final dessert. If you love chocolate as much as I do you couldn’t not be excited by a plate full of chocolate based treats. It wasn’t called ‘Chocolate Delight’ for nothing! I particularly enjoyed the chocolate ice cream which was intensely flavoured as well as the cookie which was soft, chewy and delicious. I even stepped in to finish off Mrs FGs plate as I could see that was really struggling. The only thing I didn’t enjoy and in fact the only bit of food I didn’t finish during the entire meal was the coffee/chocolate jelly but that’s purely down to the fact that despite loving coffee I’m not fond of coffee flavoured desserts. Other than that it was another stunning dish and a fitting end to any meal. 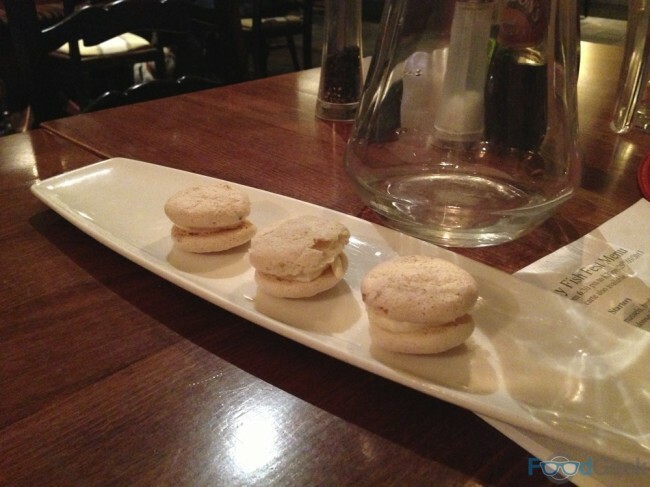 Although it wasn’t quite the end as we then received a plate of petit fours. Cute little meringues or macaroons, almond flavour I think. Despite them being very nice and also quite light I had to finish most of Mrs FG’s for her. It would have been rude to have left anything (except the coffee/chocolate jelly) on the plates after being treated to such an amazing feast. I REALLY enjoyed the Parkers Arms. It’s not your average pub food; I’ve eaten at Tom Kerridge’s 2 Michelin starred ‘The Hand & Flowers‘, Heston Blumental’s ‘The Hinds Head‘ as well as many other pubs/country inns with Michellin stars and higher recognition but my night at The Parkers Arms was right up there with the best of them. The cooking is of the highest order, the dishes somewhat traditional and classic but given a twist by combining with modern techniques. Ingredients are not only top quality but local and seasonal and it’s exceptional value for money. There are not many places I’d happily drive for over an hour to eat lunch at but this is definitely one of them. Service was also brilliant all night thanks to the charm and effort of AJ. He went way beyond the call of duty when at one point when he disappeared for 10 minutes to the cold, dark, snowy garden armed only with a pocket torch to search for enough mint to make me a Mojito! I just can’t wait to get back there. The Sunday roast menu looks particularly inviting.